Staying positive is not that simple. This is the common notion of most individuals especially those who have been going through difficult times more often than the others. Exhibiting a much inappropriate and negative behavior is considered by many as a much easier to have rather than being optimistic in times of troubles, pain and grief. Life is never easy. However, you must also admit that there are those who may have been born with all the good things in their life. They may have the talents or skillsets which you may have wanted for a very long time, wealth, power and many more. These may be true but you have to also realize that all of us have gone through our own set of ups and downs. Problems happen to everybody and not just you. Staying positive is never that easy especially if you are going through tough times. However, if you do stay positive even during these instances, you will reap the benefits of your efforts. You will be able to deal and cope with your daily routines easily. You will become more optimistic and you will be less likely to think negatively which will just add up to your worries. If you make an effort to have a positive outlook in life, you will notice that you will become more efficient, more successful and happier. This is the type of state of mind which you should start developing. You can turn your whole life around if you take on a positive outlook in life. You will have a brighter outlook at all the things that you do. With this attitude, you will not only live your life to the fullest and it will also positively impact those who are around you. 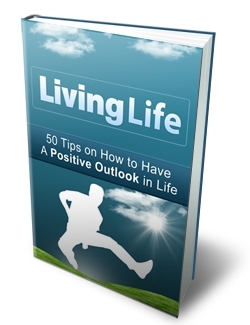 This ebook contains the Top 50 tips which will help you have a better and positive outlook in life.